To explain that, Kate Bischoff, attorney and HR consultant at tHRive Law & Consulting, uses a family holiday dinner: Your mom guilts you into coming only to seat you next to your racist uncle, the one with no filter between brain and mouth. You put up with him to keep peace, biting your tongue and counting the minutes until you can get out of there. “This is exactly what harassment victims are doing every single day,” Bischoff says. 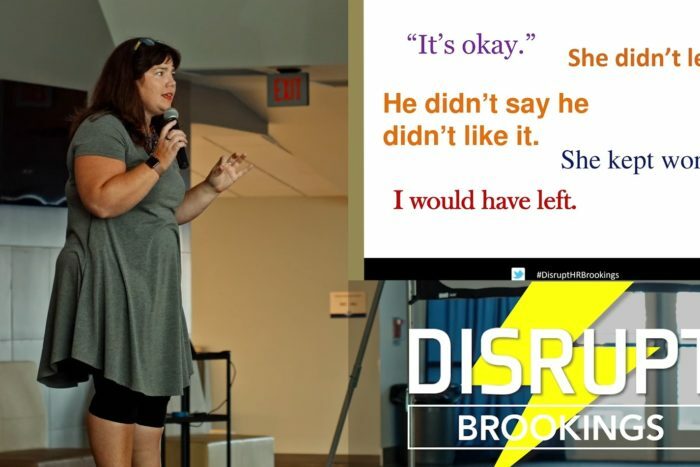 When a harassment victim does speak, Bischoff tells her Brookings, SD DisruptHR audience to let go of the “welcomeness” of the behavior. When a victim shrugs off an encounter with an “It’s OK,” it doesn’t really mean it was OK any more than saying that meant what your uncle was saying was acceptable. In partnership with DisruptHRDisruptHR, TLNT presents some of the best Disrupt presentations from events across North America and now the world. Disrupt talks are modeled on the TEDx concept: Short, to the point talks on all things HR — talent, culture and technology.